As many of you already know, a mosaic is a pictorial composition made with fragments of material of different colors and type (called tesserae). The artists who made the earliest mosaics decorated objects and buildings using natural stone, more important work might include include gems and precious metals. Later with the discovery of how to make colored glass and glazes these materials were also incorporated to enrich the color palette. The worlds oldest mosaics are found in Turkey and indeed the mosaic tradition is based around the Mediterranean and was spread by the Roman Empire. Other forms of mosaic can be found in Pre-Columbian civilizations in South and Central America. 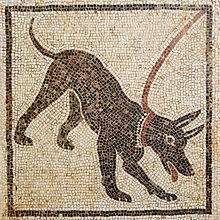 The term mosaic has uncertain origins. It may come from the Greek µουσαικόν (musaikòn) which means “patient work worthy of the Muses”, or from the Latin opus musivum which means “work of the Muses” although this referred also to the layer applied on the walls of the caves dedicated to the Muses, often made with pebbles and shells. Afterward the adjective musaicus began to denote the mosaic work itself. Bestiarii, Roman entertainments from the I century - Jamahiriya Museum, Tripoli. Someone suggests that the term mosaic would derive from the Arabic muzauwaq “decoration”, some other claims that it may be Semitic because the word recalls Moses. The truth is that none of the hypotheses can be fully supported.